FINALLY, a rare opportunity for one lucky Buyer! In one of THE most tightly held pockets in Stafford Heights, this substantially renovated, spacious home is ready for you. Situated on 733sqm, with only one direct neighbour and an elevated outlook over the Downfall Creek recreation area – there is a real sense of your own private oasis. This single level home will likely hold wide appeal to those who want generous spaces and plenty of storage. Immediately upon entering the foyer you will appreciate the wide hallway & glassed void which enhances the light and sense of space within the home. All the hard work is done here. The BRAND NEW open plan kitchen is beautifully appointed with Silestone benchtop, 900m pyrolytic oven, 6 burner induction cooktop, built-in microwave and soft-close cupboards and drawers. Just fabulous. BRAND NEW and beautiful floor tiles cover all the high traffic zones and allow for easy care living. The separate study and living areas are located at the front of the home with wide connecting walkways. Three bedrooms are located together including the master bedroom which boasts a very generous ensuite and walk in robe. 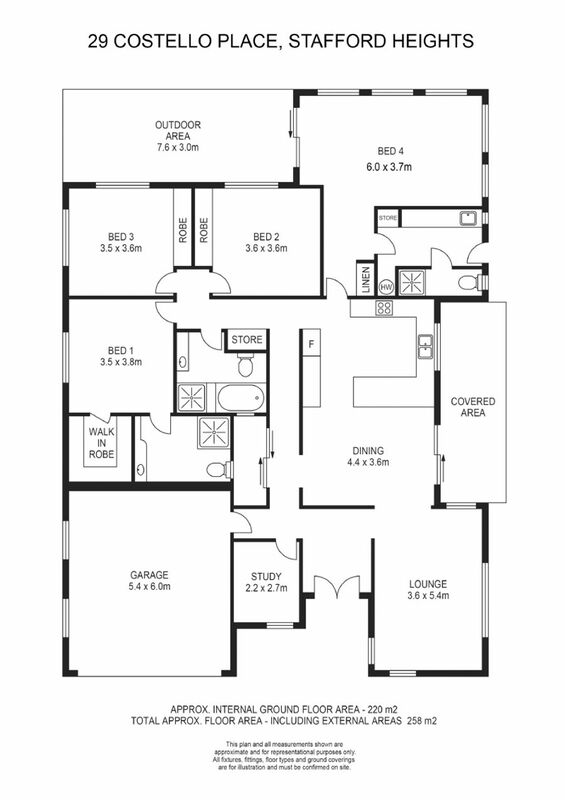 The fourth bedroom could also be utelised as a second living space – depending on the family requirements. This zone also has easy access to another bathroom making it ideally practical for either choice. Costello Place has easy access to numerous public and private schools (& their bus routes), hospitals and pleasingly close to several public transport options. Shopping options are just minutes away: Northwest Plaza, Stafford City, Westfield Chermside, and the Everton Park shopping precinct with cafes, and restaurants. MONARC, a one-hectare precinct in the heart of Brisbane’s Everton Park, (right next door to the Woolworths) is only 5 minutes away. This redevelopment is set to become Brisbane’s next destination precinct with apartments, restaurants and medical facilities. If you are seeking a lovely home in a peaceful and quiet location – your search is over! Call Allie Coutts for further information.